BROCCOLI & CARROTS WITH GINGERED BUTTER | Jane Lear. Writing on Food and Travel. Lovely spring ingredients are just starting to appear at the markets in New York City, but you couldn’t really tell by a peek inside our vegetable crisper. Aside from fat bunches of kale and overwintered broccoli rabe—destined for meals later in the week—all I’ve got to work with at the moment are broccoli and carrots. Those vegetables may sound like Dullsville this time of year, but they are absolute lifesavers when you are too busy to think about what to cook and people are depending on you. I count on them to fill in the cracks of many a scratch supper. The secret is gingered butter. I first encountered this stunningly simple sauce, spooned over a platter of asparagus, at a friend’s dinner party a good 20 years ago. For a long while, I made it all the time, but then it fell out of my culinary rotation. For the life of me, I can’t imagine why. 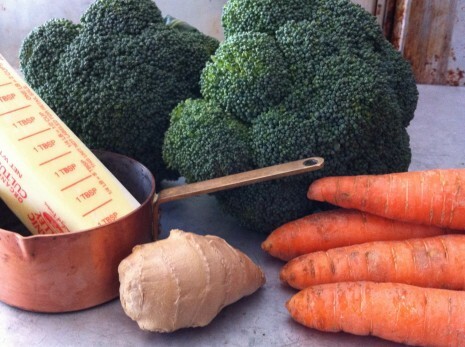 The beauty of good butter infused with lush, pungent ginger is that it embraces almost every vegetable you can conjure. It can unify the oddments we all have floating around in the refrigerator—half a cauliflower and a handful of green beans, for instance. Or it gives a single vegetable—roasted beets, say, or steamed bok choy—gloss and import. Even though grating the ginger instead of finely chopping it may seem like a pain, that juicy, tender pulp is what makes the sauce. Use the freshest ginger you can find; it should be firm, unwrinkled, and heavy for its size. I happen to like gingered butter just as it is, simply seasoned with salt and pepper, but for variety, try swirling in grated garlic, toasted mustard seeds, fresh lemon zest, or a smidgen of cayenne. You can’t go wrong. This side goes with practically anything, from broiled fish flllets to pork chops, meatloaf, or a grilled steak. It’s also delicious served in a tumble over rice and eaten in front of the television. 1. Grate the ginger on the medium holes of a box grater or a Microplane grater; you should have about 1 tablespoon of juicy, liquidy pulp. Melt the butter with the ginger in a skillet over low heat and set it aside to infuse. It should look sludgy and smell absolutely wonderful. Season with salt and pepper. 2. Cook the vegetables in a large pot of boiling salted water, uncovered, until just barely tender. This should take only a couple of minutes once the water comes back to a boil, but it all depends on how fresh your produce is and the size of the pieces, so be watchful. Drain the vegetables in a colander, run under cold water, and blot dry. 3. Reheat the gingered butter over moderate heat. Add the vegetables and cook, tossing them with the gingered butter to coat evenly, until they’re hottened up nicely, then serve at once. Posted: April 17th, 2012 under cooking, recipes, scratch supper. Love simple, flavorful & versatile.